Wednesday night: Variable clouds. Lows around 20. 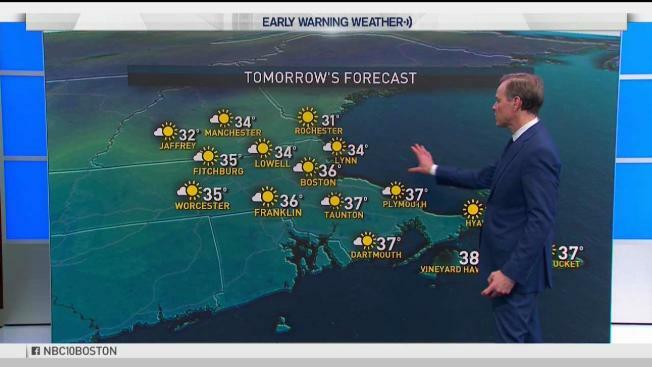 Thursday: Mostly sunny. Highs in the 30s. The air over New England on Wednesday is dry regionwide. Dry skin, chapped lips and perhaps headaches are sure signs of dehydration, so be sure to drink plenty of water. This dry air not only dries the body when outside but even more inside: heated air in a building only further drives the relative humidity down. The result of so much dry air is a virtual inability to generate any large swath of meaningful snow in this cold air, which is why even a moderate atmospheric disturbance aloft Wednesday is capable only of generating some mountain flurries in northern and western New England. This same dry air will deliver another sunny day Thursday until high altitude clouds begin increasing later in the day ahead of a large storm strengthening in the nation’s midsection and pushing into the Great Lakes. The approaching storm will induce a southerly wind, favorable for carrying warmer air into New England. A brief burst of wintry mix is possible for the interior of Southern New England after midnight Thursday until sunrise Friday. Temperatures on Friday for most of the southern half of the six-state region will rise into the 40s to near 50 with a change to plain rain early in the day. Nonetheless, some limited accumulation of snow is possible Thursday night to early Friday morning, particularly in Central and Western Massachusetts, so some slick spots are possible for the Friday morning commute. Central and Northern New England will stay as snow and mixed precipitation a bit longer, with a few inches of snow falling in the northern mountains. Mild air will likely linger into Saturday morning over the southern half of New England before another cold shot drops in from the north. This will prompt Saturday snow showers in the mountains and a cooler breeze elsewhere, leading to a sharply colder Sunday. Cool to cold air lingers in New England next week, with multiple disturbances elevating the chance for snow, though it’s early to say what days will see the best chance of meaningful flakes.